The Federal Reserve did not see the financial crisis coming, Fed Chair Janet Yellen said at Harvard University, where she was awarded the Radcliffe Medal. The Federal Reserve did not see the financial crisis coming, even though there were apparent clues. "We saw trees, and the house-price bubble was a tree," Fed Chair Janet Yellen said last week at Harvard University, where she was awarded the Radcliffe Medal. "We really didn't see that coming." She said the explosion in borrowing was a sign, but the Fed did not see the risks evolving into a full-blown crisis. Yellen said former Fed Chairman Ben Bernanke did a "magnificent" job in steering policy to heal the economy after the Great Recession. He was the "right person with the right intellectual background and courage to think outside the box," Yellen said. On future monetary policy — what most people really wanted to hear about — Yellen said a rate hike in the coming months may be appropriate. This isn't new from her. Minutes from the FOMC's April meeting made specific reference to their June meeting as a possible time for a rate-hike vote. 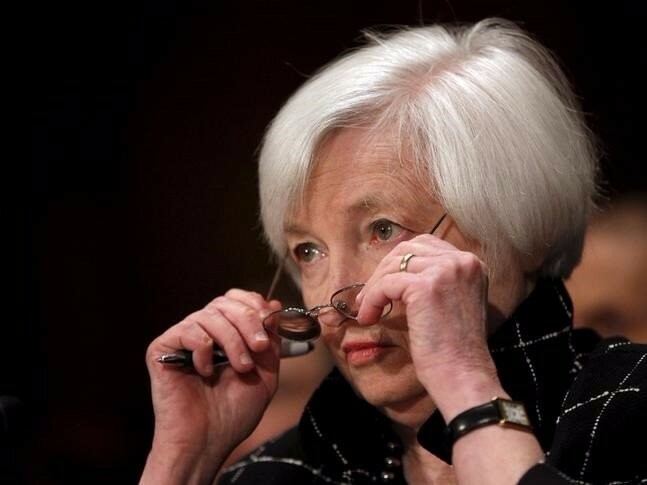 "If they were worried there was a difference between the market view and their own view, they probably resolved that worry by publishing the minutes and making clear what their view is," David Blitzer, chairman and managing director at S&P Dow Jones Indices, told Business Insider ahead of Yellen's remarks. Yellen's comments renewed the market's conviction that the second rate hike of this cycle is drawing near. Treasurys fell, and the odds of a rate hike in the Federal Fund Futures market increased. Stocks slid to the lowest levels of the day. Yellen repeated that if rates rise too quickly and there's a severe financial or economic downturn, there are limited policy tools the Fed would have to respond. For this reason, the Fed intends to proceed slowly. We'll hear from Yellen one more time before the FOMC's next meeting, when she speaks at a World Affairs Council event in Philadelphia on June 6.